KUALA LUMPUR: PAS’s Shura Council has endorsed a plan allowing the Islamist party to cooperate with any party for the sake of Islam, but ruled out joining ruling coalition Barisan Nasional (BN). The party’s top decision-making body said it came to this decision at a meeting on Saturday, after taking into account Islam’s views on cooperation and helping others. “The PAS Shura Council, which convened on Jan 2, 2016, agreed to continue the agenda of cooperating with any quarters on all that is good and religious in order to strengthen Islam and its struggle. “The PAS Shura Council also stressed that PAS will not join BN,” said Shura Council secretary Dr Nik Mohd Zawawi Salleh in a statement. Talks of an alliance between PAS and ruling Malay party Umno began when PAS president Datuk Seri Abdul Hadi Awang offered to “advise” the government in November, amid attempts by other opposition parties to force the resignation of Prime Minister Datuk Seri Najib Razak by voting down Budget 2016 in the Dewan Rakyat. 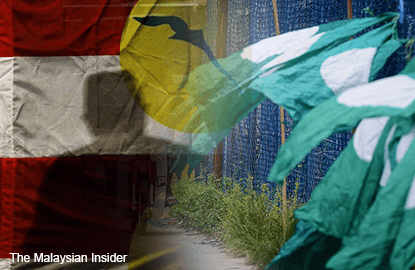 Najib eventually proposed that Umno work with PAS to build a perfect Malaysia, in line with Islamic ideals, during the ruling party’s annual general assembly early last month. Najib and Abdul Hadi were last seen together in matching pink Baju Melayu at a regional conference for al-Azhar alumni in Kuala Lumpur on Dec 17. PAS election director Datuk Mustafa Ali said the party would not strike up a “tahaluf”, or political cooperation, with Umno. PAS-Umno relations would only be in the form of “taawun” — cooperation for the sake of doing good, said Mustafa. “Taawun is okay, but not tahaluf,” Mustafa told The Malaysian Insider when asked to explain the Shura Council’s decision. PAS will only “tahaluf” with PKR and other small parties and non-governmental organisations for the upcoming 14th general election, said Mustafa. He said the “tahaluf” would not be extended to Umno, BN nor Pakatan Harapan. “We will taawun with Umno for all that is good. For instance, to develop the bumiputera economy, or to develop the use of Bahasa Malaysia, but we will not be having a tahaluf.